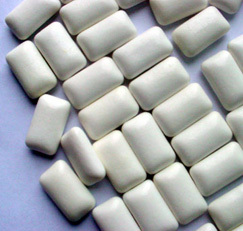 Sugarless gum seems practically virtuous—a sweet treat with few, if any, calories and no sugar. Yet a report in the British Medical Journal told of two patients who experienced serious and inexplicable pain or gas and diarrhea, along with extreme weight loss… which doctors finally tracked down to their heavy gum chewing habits—around 20 sorbitol-sweetened sticks a day. Commercially produced sugar alcohols such as sorbitol—and indeed, all its cousins with the “ol” suffix, including xylitol, erythritol and mannitol—are widely used as substitute sweeteners. Sorbitol, in particular, is used in cough drops and a wide variety of diet and diabetic food products, including candies, cookies, cakes and sugar-free maple syrup. Labels proudly proclaim the sugar-free, low-calorie status of these foods—what they don’t say, however, is that ingested in large quantities, the sweetener they are formulated with is known to cause abdominal pain, bloating, gas and diarrhea. Interestingly few people have such troubles with natural sorbitol, found in some fruits such as apples, cherries, peaches, pears, plums and prunes. According to Daily Health News contributing medical editor Andrew L. Rubman, ND, excessive sorbitol disrupts the large intestine’s natural function of recapturing water from the mass that passes through it. This potentially creates wider imbalances in the microfloral community in the gut and the underlying tissues, which—as regular readers have heard before—creates a difficult set of problems. In fact, the FDA regulates sorbitol, requiring information about gastrointestinal side effects on the label if the sorbitol-containing foods might result in a total daily consumption of 50 grams. A stick of gum or a candy contains only a gram or two of sorbitol, so it carries no cautionary information. This is unfortunate, to say the least, since much lower levels have been known to cause harm. The patients described in the study lost 20% of their body weight, consuming 20 to 30 grams of sorbitol daily for months. Study authors warned that as little as 5 to 20 grams a day could result in bloating and cramps. According to Dr. Rubman, it’s a question of sensitivity and degree of exposure. Some people—especially children, people who are chronically ill and individuals with digestive issues—are naturally more sensitive than others, and cumulative exposure to even small amounts of sorbitol can quickly add up in the short run. If you are indeed sensitive, you have probably noticed this effect already. Your best bet: Eat real foods. Time and again, we see new evidence that the empty calories and additives in processed foods are just not worth it.